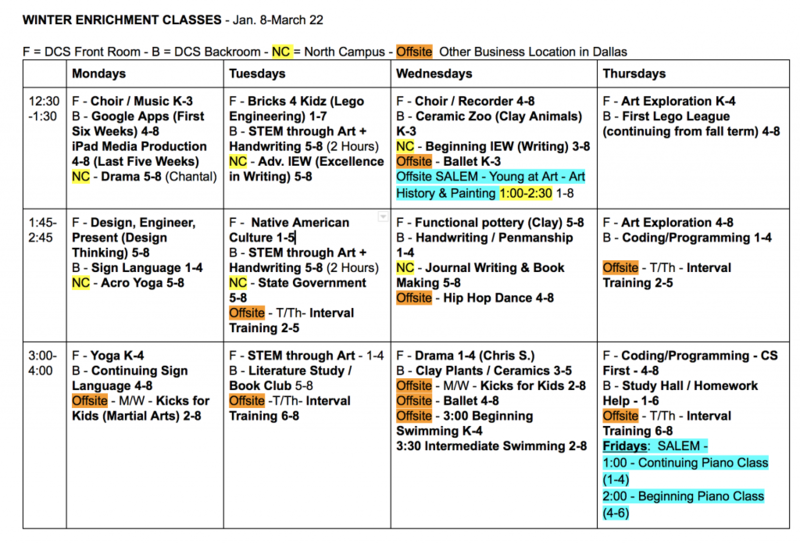 Winter Enrichment Course Enrollments Open! Enrollments will open in the Active.com online enrollment system at 5:00 pm on Tuesday, Dec. 12 and the deadline for enrollments will be 12:00 pm (noon) on Monday, Dec. 18. Please note that all class lists will be finalized with input from the Guides, so if you end up on a waiting list for a class that your child really wants or needs for some reason, please let your guide know and we will take this information into account when finalizing the class rosters by Tuesday, Dec. 19. Use THIS LINK to enroll in enrichment courses starting at 5:00 pm on Dec. 12. In the system, you can sort classes by location (click OREGON in the Location filter to get a list of our class locations) or by day of the week using the Calendar view instead of the Session List view. Click on a class name to see the course description and information about instructors and locations. Don’t worry about being the first to enroll, we really don’t anticipate having any problems getting students into all or most of their enrichment class choices, and we can be flexible with some numbers. All class lists will be finalized on Monday, December 18 and Tuesday, December 19, with input and confirmation from the DCS Guides. Our next regular scheduled board meeting will be April 18th at 7 pm, and will be held at the Dallas Community School site, 124 SW Walnut Ave Dallas, OR 97338. All are welcome! We will be having an Executive session directly following the regular board meeting pursuant to (ORS 192.660(2)(d)). Weather-related school closures will be posted here, and also on the DCS Facebook Page and on the DCS Families Facebook Page.